The Objective: To analyze the liquid and gas flow behavior in venture scrubber. Solution: The flow inside the venture scrubber was successfully simulated considering the boundary conditions and appropriate turbulence model. 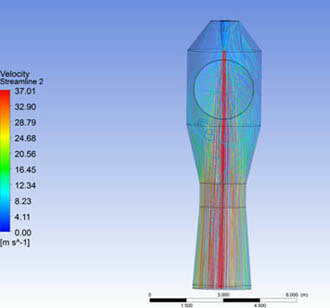 Different velocity streamlines from gas and liquid flows provided insights on scrubbing process inside the venture scrubber, assisting the client in design optimization. Venturi scrubber utilizes high velocity liquid spray to absorb solid particles and filter the gas stream effectively. It is crucial for the scrubber to ensure that the liquid spray comprehensively comes in contact with the gas flow, in order to efficiently filter the solid particles. A leading process equipment manufacturer from US utilized our simulation capabilities to perform design optimization of the venture scrubber for effective filtration of the gas. 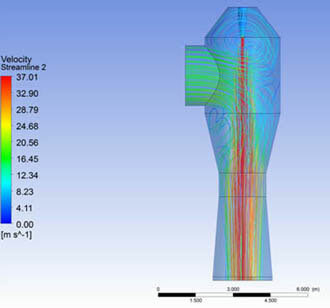 The venturi gas scrubber was successfully simulated through CFD tools and insightful results were obtained. The liquid flow through the nozzle as well as the gas flow through the inlet was modeled adopting suitable turbulence model. The velocity streamlines for both the flows showed that there is sufficient contact period of the liquid spray with the gas, ensuring the efficiency of the design. The exit spray angle for the nozzle was also measured to identify its reach in the designed chamber.